Cuba will have to integrate (reincorporar) businessmen, managers, engineers and all sorts of professionals who are currently in exile. This integration should be carried out gradually because, if it were carried out massively, it would bring about economic, social and cultural clashes with our brethren who remained in Cuba that would create grave obstacles to the complete and absolute patriotic reunification of all Cubans (Pazos 1991, p. 254). Has return migration of skilled persons and professionals been a significant problem in the transition from socialism to market economies in Eastern Europe and the former Soviet Union and in transitions elsewhere? With the benefit of more than a decade since Pazos’ seminal paper, does the return migration of skilled persons and their integration into the Cuban economy still appear to be one of the key problems of the Cuban transition? Returning migrants are persons who have been abroad as migrants in a country other than their own for a significant period of time and who return to their own country to settle in it. The consensus among scholars is that return migration is a topic that has been largely neglected in international migration research. Occasionally, analysts have given some attention to return movements, as they did for example in the 1970s following the dismantling of Western Europe’s “guest workers” programs and the return of migrant workers from the Gulf States, but these analyses have been handicapped by the absence of longitudinal data and have relied primarily on isolated empirical or anecdotal evidence (Ghosh 2000, pp. 1-2). Many developing countries have put in place return incentive schemes to encourage skilled workers to return to their homeland, thereby reversing the socalled “brain drain.”2 These programs have tended to use a mix of inducements such as housing aid, exemptions from customs restrictions and customs duties for returning migrants, employment services, training, paid return travel, tax relief, special business loans, and programs to assist in the education of migrants’ children (Rogers 1981, pp. 347-349; Pastor and Rogers 1985; Mármora, 1997). Return-incentive schemes used in Latin America have not been successful in generating significant return flows; they seem to have operated more as reintegration aids for migrants who would have returned anyway than as genuine return incentives (Rogers 1981, p. 349). Although much smaller than the brain drain, there is a corresponding “brain return” flow of skilled migrants that return to their home countries. This return flow of skilled migrants traditionally developed along colonial lines. However, more recently, return migration has also developed across the former “iron curtain,” as migrants from countries now in transition to democratic, market economies have had the ability to return to their home lands. Another return migration flow relevant for our thinking about return migration of skilled persons and professionals to Cuba is the voluntary return of Chileans to their country after the democratization process that began in that country in 1990. The lifting of the Berlin wall and the fall of communism in Eastern Europe and in the Soviet Union could have been expected to trigger massive return migration, as these countries began a transition to democracy and market economies. The overwhelming evidence points to no such massive return migration. The literature points to modest return migration of professionals, persons with family links and members of ethnic minorities shortly after the beginning of the transitions, spurred by actions taken by the countries to modify their nationality laws to allow expatriates who had been deprived of their citizenship to reacquire it. This seems to have been the case in Poland, Hungary and the Czech Republic (SOPEMI 2000, pp. 70-71). In the Czech Republic, for instance, the opening of the borders at the beginning of the 1990s led to a sizable flow of immigrants returning from Western Europe who were able to prove their Czech origin; the subsequent division of the Czech and the Slovak Federal Republic also led to migration flows across their common border (SOPEMI 2000, p. 67). There is no evidence in the literature that these return migrants have had an adverse impact on the domestic labor market of the countries receiving the migrants. In fact, Romanian authorities actively encourage return migration (SOPEMI 2000, p. 67). An interesting case study of return migration issues and potential problems is that of citizens of the former Soviet Union upon the break-up of that political entity. The existence of the Soviet Union caused the dispersal of people across what today are different countries. The largest ethnic group living outside its own republic was the Russians who, for political, administrative or economic reasons, had moved to other republics. According to the 1989 Census of the Soviet Union, about 20 million or 17 percent of Russians lived outside of the Russian Federation. The “Russian diaspora” in the other republics tended to be a privileged minority. Once the republics gained independence from Moscow, they passed laws that give advantages to their indigenous nationalities (e.g., legislating knowledge of the local language as a condition for employment or citizenship), thereby inducing Russians to return to the Russian Republic. The same situation occurred with other republics of the former Soviet Union with high percentages of their ethnic populations outside their borders, such as Armenia (33 percent of ethnic Armenians resided outside the country’s borders), Belarus (21 percent) and Ukraine (15 percent). These population flows have the potential for affecting the countries of emigration (who may lose a significant portion of their skilled workforce) as well as the ethnic home countries, not ready to receive large numbers of their own nationals (Stalker 1985, pp. 215-216). The September 1973 coup d’état that brought the military into power in Chile provoked the exile of a large number of Chileans, estimated as high as 200,000 by some analysts. Although Chilean political exiles migrated to every corner of the planet, the bulk settled in Latin America. Partial data show that in 1984, 44 percent of Chilean exiles had settled in Venezuela, 37 percent in Western Europe (of which 10 percent in Spain, 8.3 percent in France, 6.6 percent in Italy and 5.5 percent in Sweden), 8 percent in North America (of which 6.7 percent in Canada), 5 percent in Australia, and 3 percent in Eastern Europe and Asia. Shortly after taking over, the military regime modified national legislation to allow for the administrative exile of Chilean citizens and began to use this power to send opponents abroad. Later, legislation was passed to restrict the return of persons who had left the country voluntarily or involuntarily. In 1982, the military government shifted gears and began to accept the return of some exiles, subject to restrictions, among them the explicit permission of the Ministry of the Interior for the person to return. This move did not generate a significant flow of returnees. All restraints were lifted in 1988, and Chileans were allowed to return to their country freely. In April 1990, the new democratic government of Chile created the National Return Bureau (Oficina Nacional de Retorno) to facilitate the return of Chileans and their families who had gone abroad as exiles. The Bureau, with financial backing from foreign governments, eased the return and reintegration into society of Chilean exiles and their families through assistance in reestablishing the rights of exiles, facilitating recognition of professional titles, abolishing duties to import domestic and professional goods, legalizing the residence status of non-Chilean spouses, facilitating the integration of students into the educational system, providing orientation and psychological assistance, facilitating loans and credit, and assisting people in resolving their housing and health needs (Llambias-Wolff 1993, p. 589). An examination of the characteristics of returnees and their families assisted by the National Bureau of Return through February 1992 revealed that 68 percent of the returnees were professionals or technicians, 13 percent were administrative employees or business persons and only 15.6 percent were manual workers. In terms of education, 34 percent had completed university education, 13 percent had some university-level education, and 15 percent had completed technical education; only 9 percent of the returnees indicated their highest level of educational achievement was primary education. Interestingly, 42 percent of the returnees were unemployed, 36 percent were employed and 12 percent were in the process of evaluating their employment opportunities to determine whether they would resettle in Chile or go back to the country to which they had migrated. In order to assist unemployed returnees, the government provided working scholarships, labor reintegration and working fund supplements and credits to set up their own businesses. The 1959 Cuban revolution sparked an emigration flow, which is still ongoing, of over 1.3 million persons. Although precise statistics on the magnitude of the emigration flows are not available, the 2000 United States population census enumerated 1,241,685 persons of Cuban origin residing in the United States (U.S. Census Bureau 2001).4 Significant concentrations of Cuban expatriates also reside in Puerto Rico, Spain, Mexico and Venezuela, just to name a few countries. Unfortunately, there is no systematic information on the demographic and socio-economic characteristics of the overseas Cuban community. As has been indicated above, Cuban expatriates have settled in numerous foreign countries, primarily the United States, but also Puerto Rico, Spain, Venezuela and Mexico. The decennial U.S. Census of Population offers a wide range of socioeconomic information for ethnic groups residing in the United States, including persons born in Cuba or of Cuban origin. Detailed statistics on the characteristics of ethnic groups collected for the 2000 U.S. Census of Population are not available at the time of this writing. In what follows, information derived from the 1990 Census is used, with the caveat that the data are a decade old. 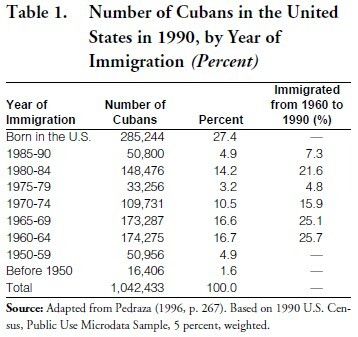 According to the 1990 U.S. Census of Population, slightly over one million persons (1,042,433) born in Cuba, or born in the United States of Cuban origin, resided in the United States in 1990 (Table 1). Since out of this population, 285,244 persons (27.4 percent) were born in the United States, the number of persons born in Cuba that migrated to the United States through 1990 was 757,189 persons; 689,825 (93.5 percent) of these persons entered the United States in 1960 or later, while 67,364 (6.5 percent) entered before 1960. Table 2 provides selected socioeconomic data on the Cuban-born population that migrated to the United States in 1960 or later: economic status (as measured by the poverty line) and occupational attainment. The cohort that migrated to the United States in 1960-64 had a very low percentage of persons below the poverty line (8.5 percent) and a very high percentage of persons with high occupational achievement: 35.9 percent were in managerial and professional positions and 34.7 percent were in technical, sales and administrative support positions; at the other end of the scale, only 10.8 percent were in blue collar positions (operators, fabricators, laborers) and 0.7 percent in farming, forestry and fishing occupations. In contrast, the cohorts that migrated more recently (1982-90) had 27.5 percent of their members below the poverty line and had much lower percentages of persons in professional and technical occupations (10.4 percent in managerial and technical occupations and 23.5 percent in technical, sales, and administrative support occupations) and higher percentages in blue collar occupations (28.3 percent were operators, fabricators and laborers). When the Cuban transition to democracy and a free market finally arrives, what will be the behavior of Cuban emigres and their families? Will they leave their host country and whatever goodwill and material goods they have accumulated to return to their homeland? Or will they instead remain in the host country and maintain an arms-length relationship with the homeland, traveling there for visits and vacations, but not making the commitment to return? Will they feel compelled to return to make a contribution to the rebuilding of their homeland or will they conclude that they can make a more significant contribution from abroad? A key factor in determining the impact of return migration on the Cuban economy and society will be the share of the emigres that actually decides to return. The decision to return is likely to be a complex one, incorporating personal, political and economic variables as well as an assessment of expectations of how conditions might develop in the host and home society. Table 3 shows the responses to this question in each of the six surveys. 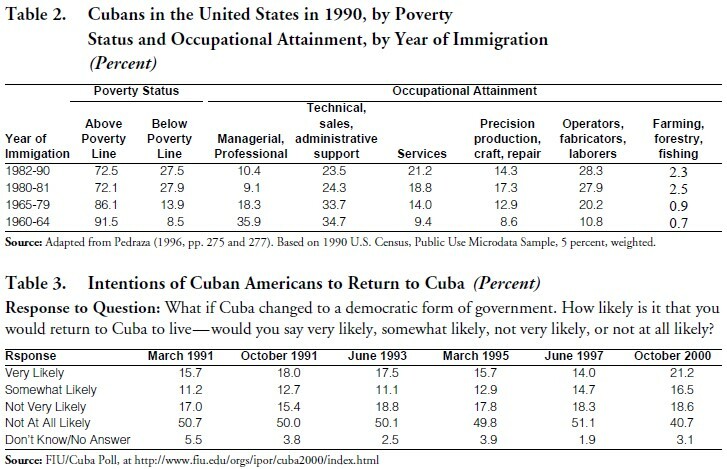 Using “very likely” and “somewhat likely” as indicators of a proclivity to return and “not very likely and “not at all likely” as indicators of the opposite tendency, the responses are remarkably stable for the period 1991-97: approximately 30 percent of respondents indicated an intention to return to Cuba once a democratic government were installed in the island and about two-thirds of the respondents indicated the intention not to return. The results for the most recent survey, taken in October 2000, show a considerably higher share of respondents (almost 38 percent) indicating an intention to return, while the share of respondents indicating the intention not to return falls to under 60 percent. There is no ready explanation for this change in attitude in 2000 regarding return to the island. To facilitate the return of émigrés, a democratic government in Cuba would have to take a number of steps to modify laws and regulations. The first steps may be to remove impediments to travel and temporary return to the island by émigrés. A second set of steps may deal with similar impediments affecting permanent return. Presently, the Cuban Constitution provides that Cuban citizenship is lost by becoming a citizen of a foreign country,7 and holding a dual citizenship is not allowed. Thus, unless the new constitution or other transition period statute provides otherwise, the Cuban émigrés who have become naturalized citizens of other countries, including the United States, will have to renounce the other country’s citizenship and apply for reinstatement of their Cuban citizenship (Travieso- Díaz 1998, pp. 81-82). Thus, a democratic Cuban government would have to take positive action to clear the way for the permanent return to the island of those Cuban citizens who have lived abroad for considerable periods of time and adopted another country’s citizenship. Remittances, the funds that migrants send to their relatives and friends in the home country, are a critical flow of foreign exchange for developing countries. According to estimates by the Inter-American Development Bank, flows of remittances to the Latin American region from migrants reached an estimated $20 billion in 2000. To put the importance of such a level of remittances in perspective, the value of remittances to the Latin American region exceeded official foreign aid received by the region in 2000. For six countries in the region, remittances exceeded 10 percent of gross domestic product (GDP): Haiti—17 percent; Nicaragua—14.4 percent; El Salvador— 12.6 percent; Jamaica—11.7 percent; the Dominican Republic—10 percent; and Ecuador—10 percent. Although subject to a different dynamic because of U.S. Department of the Treasury rules restricting transfers of funds to Cuba that are part of the U.S. embargo, remittances by Cubans residing abroad to family and friends in the island grew by leaps and bounds in the 1990s. According to Cuban government official balance of payments statistics, unrequited transfers (composed mostly of family remittances) amounted to 470.2 million pesos in 1994, 743.7 million in 1996, 813.0 million in 1998, and 828.0 million in 1999 (ONE 2000, p. 132). For the sake of comparison, the value of exports of products of the sugar industry in those same years were: 759.5 million pesos in 1994, 976.3 million in 1996, 599.3 million in 1998, and 462.5 million in 1999 (ONE 2000, p. 141). That is, remittances far exceeded sugar export revenues in 1998 and 1999. It follows, then, that the Cuban émigré community already makes a significant positive contribution to the Cuban economy and to the well being of the Cuban population in the island through remittances. To the extent that once the transition begins some of the persons who currently are sending remittances to Cuba might choose to return to the island, remittances flows might decline in subsequent years. However, it is also possible that persons who are not currently sending remittances to Cuba—because they do not wish to support the current Cuban regime by providing scarce foreign exchange—may be persuaded to do so in the future if a democratic, free market government ruled in the island. This latter group might include a disproportionately large share of the persons who have been in the United States for a long period of time and may have the financial means to be significant sources of remittances. As has been discussed above, the Cuban community in the United States is quite large and has the technical and economic wherewithal to make a positive contribution to a democratic, free market Cuba. Not only could these persons contribute positively with their technical skills and the know-how they have acquired in working in market economies, but they may also have the resources to invest in the island. Émigré Cuban communities in other countries— Puerto Rico, Venezuela, Mexico, Spain—no doubt have similar attributes. In his December 1990 paper Pazos recognizes the positive contribution that returning skilled persons and professionals could make to a democratic Cuba. He writes: “The integration of exiles is not a problem, but a solution. But it is a solution that has to be implemented very carefully, because the speedy reunification of all Cubans and the prompt reconstruction of our economy depends on its careful implementation” (Pazos 1991, p. 248). He goes on to point out that his concern about the potential for a massive return of skilled persons and professionals that would disrupt the Cuban economy and society is tempered by the fact that “the bulk of these émigrés consists of officials and employees that will not abandon their current jobs to go to a country in crisis” (Pazos 1991, pp. 254-255). In fact, Pazos seems to be more concerned about returning émigré entrepreneurs and “capitalists” who may seek to purchase farms, mines or factories with the intention of modernizing and expanding them in order to increase output and profits. This taps into Pazos’ concern about unbridled foreign investment during the transition—the unregulated entry of foreign capital during the early stages of the transition, when the economy is likely to depressed, assets undervalued in domestic currency, and foreigners (or émigrés with foreign currency) may be able to acquire assets at fire sale prices. To Pazos, allowing this to happen would be tantamount to “giving away our patrimony to foreigners” (1991, p. 253). The concern about foreigner investors (including Cubans who went abroad and are able to command investment resources in foreign currencies) taking advantage of depressed asset values and controlling significant portions of Cuba’s patrimony and resource base relates to the issue of potential wealth and asset concentration and monopolistic behavior rather than to displacement of Cuban workers by émigré skilled persons and professionals. The former concerns, to the extent that they are valid, can be addressed through investment regulations. 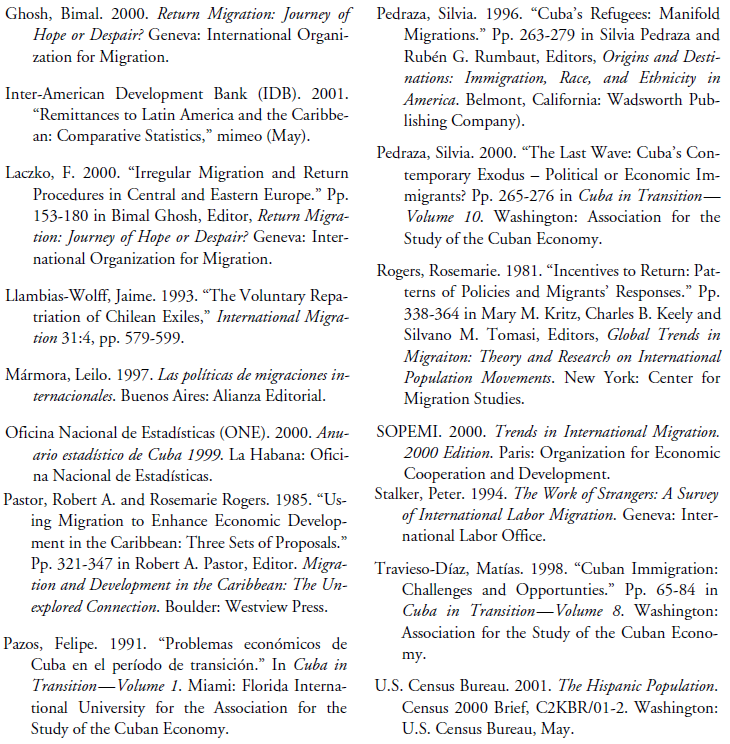 Return migration is a scantily studied aspect of international migration. Statistical information on return migration flows is very meager, particularly information disaggregated by the skills of the return migrants, reason for return and region in the home country where they resettle. Available data suggest that return migration flows are quite small in comparison with emigration flows. Developing countries actively seek the return of skilled persons and professionals that have migrated to developed countries (the so-called brain drain), often using a variety of return incentive programs. To date, developing countries have been relatively unsuccessful in generating significant return migration flows. The literature suggests that return migration was not a significant issue in the Eastern European and Soviet transitions. A decade after the transitions away from communism began, the critical migration issues for the counties of Central and Eastern Europe and the republics of the former Soviet Union are not related to the voluntary return of migrants but rather to the potential for large emigration flows and the forced return of persons that migrated illegally to Western Europe (Laczko 2000). Returning Chilean exiles faced substantial personal economic and social challenges in readapting to Chilean society, but there is no evidence that they caused significant displacement of employed persons in Chile or that in the aggregate they adversely affected the Chilean labor market. The overseas Cuban community can be estimated at about 1.4 million persons, of which over 1.2 million persons reside in the United States. This estimated overseas population of 1.4 million persons represents 12.4 percent of the island’s 2000 population of 11.320 million persons. Indeed, if a significant share of émigrés decided to return to the island suddenly, the flow of returnees could put significant pressure on resources and jobs in the island. Based on the experiences of developing countries with the so-called brain drain and of other transitions, it is quite unlikely that such a large return flow would ensue. Moreover, it is unlikely that skilled persons and professionals would constitute the bulk of returnees. As Pazos points out in his paper, skilled persons and professionals hold responsible work positions abroad and are unlikely to risk them and acquired wealth unless and until the transition is well under way. It is clear, however, that the Cuban community abroad has a wealth of technical knowledge, education, work experience in a market economy setting and financial means that could make a significant positive contribution to a Cuba of the future. A democratic, market economy Cuba can look to the émigré community as a solution to the difficulties that will like arise during the transition rather than as a problem. 1. The views expressed in this paper are solely those of the author. 2. The migration of highly educated professional workers from developing countries—from Africa, Asia and Latin America—to developed countries is often referred to as a “brain drain.” There are many reasons for the behavioral patterns underlying this so-called brain drain. One explanation is that, consistent with the human capital model, workers who embody high levels of skill seek to maximize the return of their investment and may seek higher wages for their services. However, many professionals also emigrate because there are no jobs in their home countries that match the level of skills they possess. Many students from developing countries who travel to developed countries to study get accustomed to their host countries and do not return to their homeland. Finally, policies of developed countries often attract skilled workers from developing countries, facilitating their admission and stay, and offering incentives for their continued presence (Stalker 1994, pp. 118-120). 3. This section is based on Llambias-Wolff (1993). 4. More detailed information on the breakdown on the Cuban origin population into persons born in Cuba and persons born outside of Cuba of Cuban origin will be available in the near future as the U.S. Census Bureau makes available special tabulations of th e 2000 Census. 6. This section is drawn from Travieso-Díaz (1998, pp. 81-82). 7. Travieso-Díaz (1998, p. 81) further clarifies that under Cuba’s constitutions, both pre- and post-revolution, a Cuban citizen who became a citizen of another country lost his Cuban citizenship.